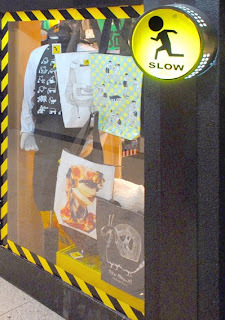 Slow Shop, tucked away on the 5th floor of a Mall by Martyrs Park metro station, is an enterprise run by designer/photographer, Ya Ya Qiu. Friends introduced us to Slow because it represents two things relatively new in contemporary China, an independent brand with an entrepreneurial spirit; ‘Take your time, it’s your life’ reads the maxim on her business card. Ya Ya divides her time everyday between the shop, designing at home, and visiting local factories discussing production. Selling clothes, accessories, soft furnishings, home wares, gifts etc… roughly 80% of the products in the shop are her design and made locally, with the remainder produced by other young local designers.